All aboard! Link plays conductor in this all-new adventure. Not everyone prefers cartoon Link, but the little rascal starred in some incredible games. The Wind Waker was a huge success on the GameCube, and its successor, Phantom Hourglass, found an even bigger reception on the Nintendo DS. Now this art style makes a return in The Legend of Zelda: Spirit Tracks, featuring a more involving storyline and a new partner play technique that should enhance the adventure. The story revolves around the actual Spirit Tracks, which serve as restraints that prevent a demon king (buried underground) from running amok. After visiting Princess Zelda's Castle, Link receives word that the evil Chancellor Cole hopes to resurrect the demon king. Both he and Zelda secretly board a train onto the Spirit Tracks, but crash after they mysteriously vanish from beneath the train. Cole shows up and cleans house, taking out Zelda in the process and stealing her body, while her spirit looks on. 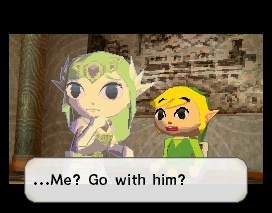 Thankfully, Zelda is still able to communicate with Link in spirit form, and accompanies him on his quest to restore the Spirit Tracks and stop Chancellor Cole. You'll need to use both characters to solve puzzles throughout the game, such as opening chests and navigating across fire and lava. Most of the time, you're in control of Link, utilizing the touch-screen for his movements and attacks. When you summon Princess Zelda through the Phantom form (originally seen in Phantom Hourglass), you simply draw a line on the touch screen, pointing out where it needs to go. You'll still run into your fair share of enemies, but combat is just as easy to perform here as it is in Phantom Hourglass. Along with his sword, Link can attack them with secondary weapons, including the boomerang (which follows whatever path you draw), a whip-like rope (which helps you cross chasms) and the Whirlwind, a rappelling mini-tornado you generate by blowing into the DS microphone. Link also uses Spirit Pipes, which work in the same way as the Ocarina; you blow into the microphone to play specific tones. Once you clear areas, you'll gain access to new ones by traveling on the Spirit Tracks. The train segments play a huge role in the game. You'll not only draw the safest route, but also maintain your speed to prevent going too fast or slow. Enemies pop up as well, so you'll need to use an on-board cannon to shoot them. On occasion, animals will walk along the tracks, so you'll blow your train's whistle to clear them away. 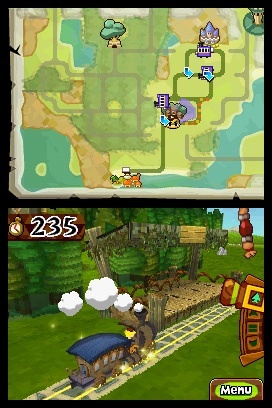 As we stated before, Spirit Tracks uses the same cel-shaded art style as previous Zelda games, The Wind Waker and Phantom Hourglass. However, it's an attractive looking game. The item selection system is fairly easy to use, allowing you to switch weapons and items on the fly. The stage design is superb, complete with mind-boggling puzzles. Overall, it's a pleasant-looking DS effort that fans will definitely get into. Due for release on December 7th, The Legend of Zelda: Spirit Tracks should be a wondrous treat for gamers this holiday season. Be sure to check back for the review. From what we've seen, it's a hot ticket.